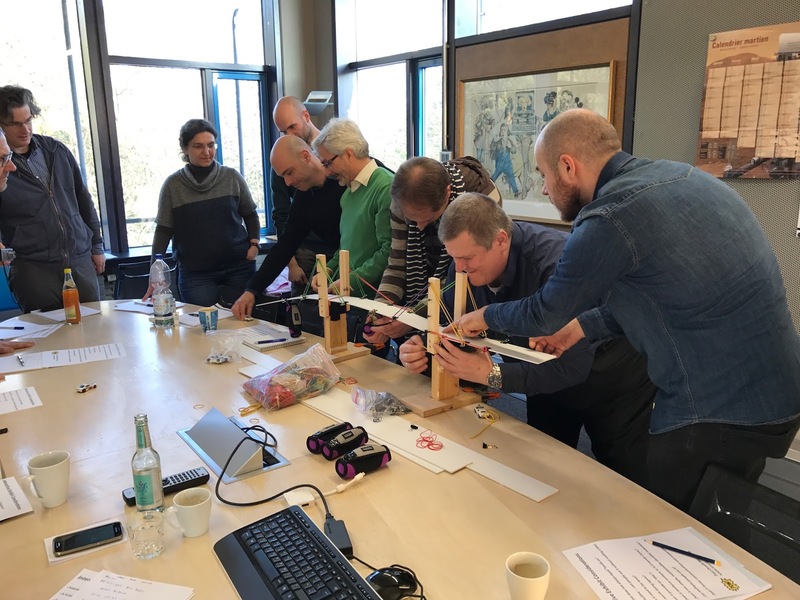 I recently returned from Germany where I was invited by Hüttinger Interactive Exhibitions in Nuremberg to present workshops to their staff and then visit museums in Berlin for coordinated staff training and learning activities. 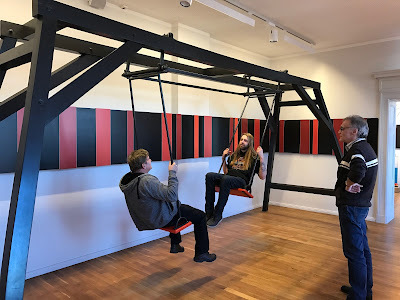 I think my experiences in a European country with different ways of approaching museums and museum work are worth sharing, so here are my thoughts about some of the things I did and saw and how they relate to museum work here in the U.S.
First off, I was very impressed with Hüttinger --- their large staff and facilities, as well as their in-house range of fabrication capabilities, were all outstanding. However, what continues to strike me the most is the Hüttinger company commitment to their employees. In addition to the staff training and learning excursion that I was a part of, I was very interested to hear about the company's profit-sharing program with their employees, and an intra-company Wiki system of documents that every employee has access to --- so that Hüttinger stands as a very open and transparent company. In my experience, this sets Hüttinger apart from many of their competitors, not only in Europe but in North America as well. In Berlin I had the opportunity to explore three places with Hüttinger staff, two museums and one corporate exhibition space. The first museum we visited was Science Center Spectrum, which by some claims is (historically speaking) the oldest Science Center in the world. The current Spectrum facility was completely revamped in 2013 and consists of thematically-arranged exhibits (Light, Sound, Heat, etc.) spread out over four floors. 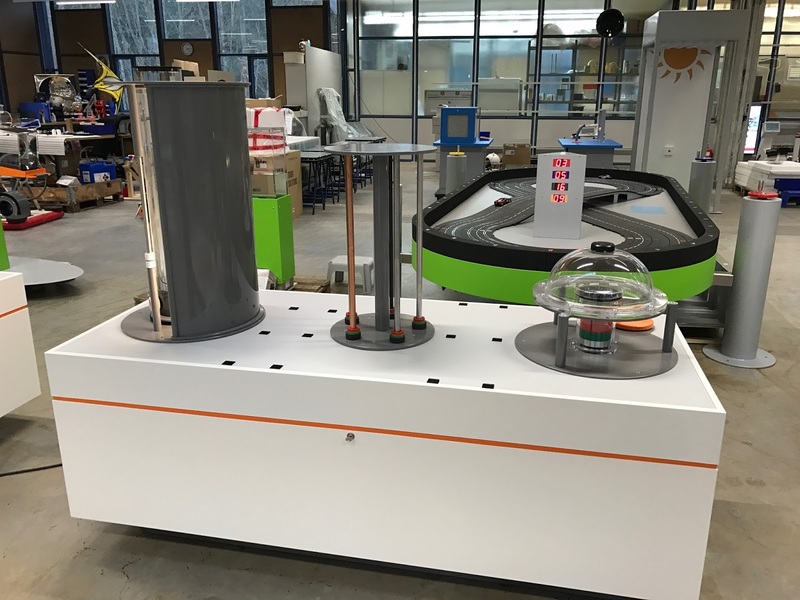 The vast majority of Spectrum's exhibits are produced in-house and so the components themselves are made in a fairly straightforward way using familiar materials. 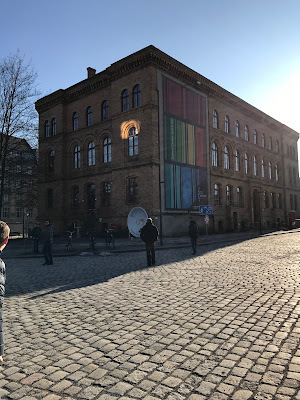 The second museum we visited in Berlin was The Museum of Technology (actually situated right next to Spectrum.) I would consider The Museum of Technology an "old school" museum in the sense of a big museum with large, yawning exhibition galleries filled with equally large artifacts like locomotives, machinery, and models. 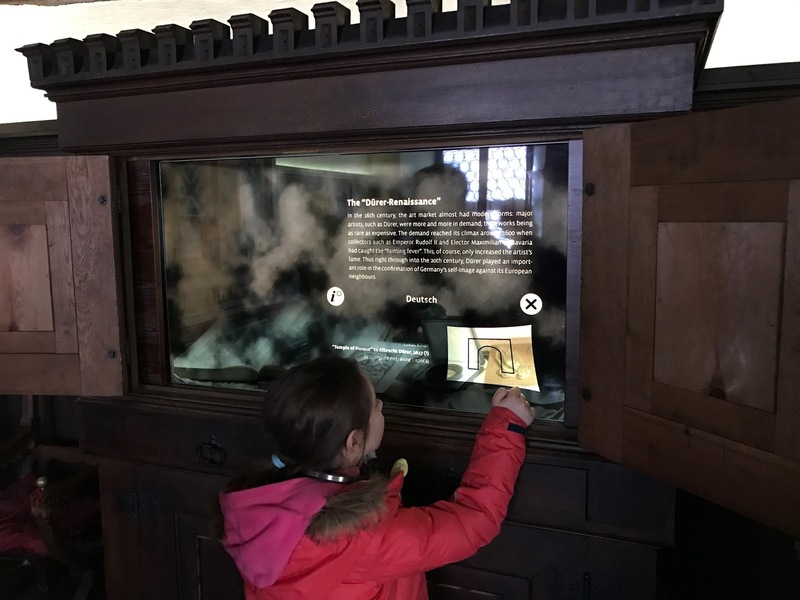 Most of the interactive experiences I encountered, whether mechanical or screen-based, seemed very didactic and oriented towards carrying very specific content messages. 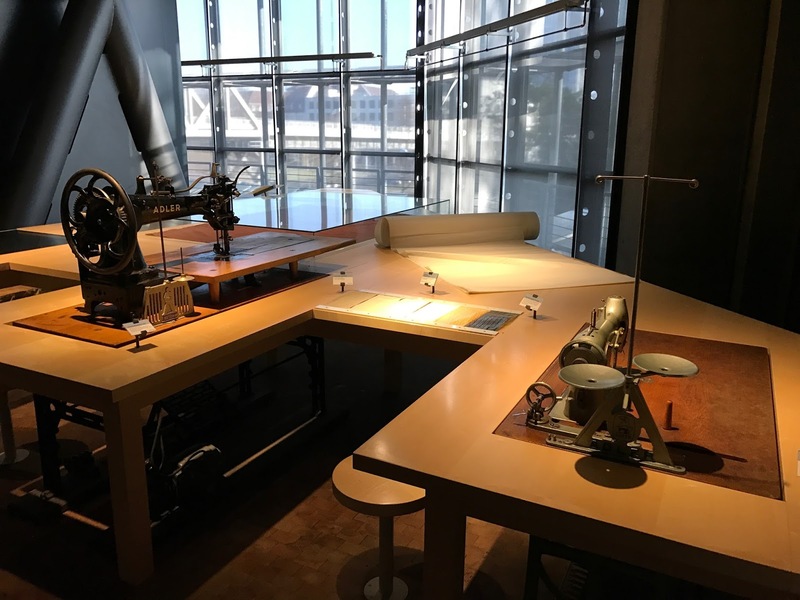 Even in collections-heavy museums in the U.S. I am used to seeing more open-ended messaging and interactive experiences. The last place I visited in Berlin was called DRIVE. 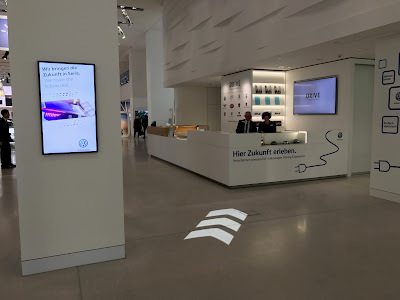 It is part corporate showroom, part auto show, part interactive exhibits gallery put on by Volkswagen inside of a large commercial space located in one of the shopping districts in Berlin. DRIVE was free to enter and when I was there showed VW products and exhibits centered around electricity and electrical vehicles. It was an interesting combination of traditional science center exhibits (in this case borrowed from Phaeno Science Center in Germany, and including some components made by Hüttinger) along with some custom-made touchscreen devices. 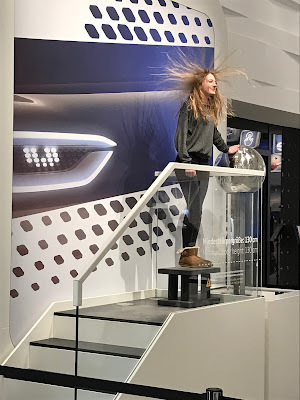 There was also the science museum standard of a large Van de Graaff generator that you could get a picture of yourself with, having all the hair on your head standing up in the air.) 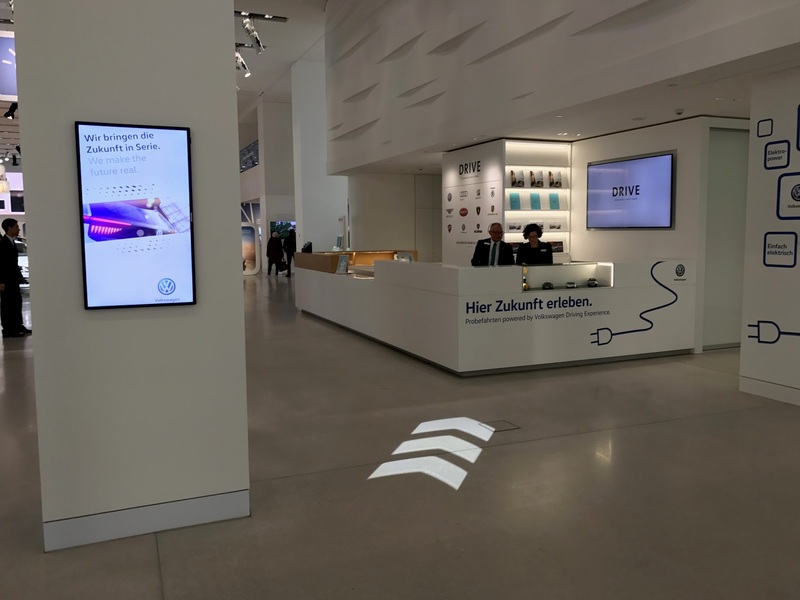 I think this "hybrid" approach of free corporate showroom exhibition galleries integrated into downtown areas is an interesting approach not really seen in North America. Since I had never been to Nuremberg, when I had a free day to explore the city, I wanted to see as many things as possible. 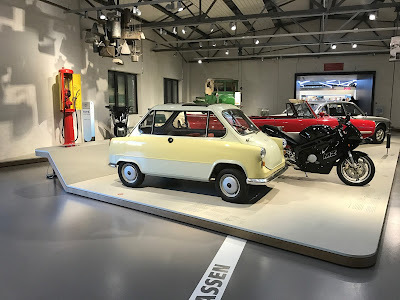 Not only did I get to walk around the Imperial Castle grounds, but I also got to visit the Toy Museum, Albrecht Dürer's House, and, most importantly, the Documentation Centre Museum at the former Nazi Party Rally Grounds. 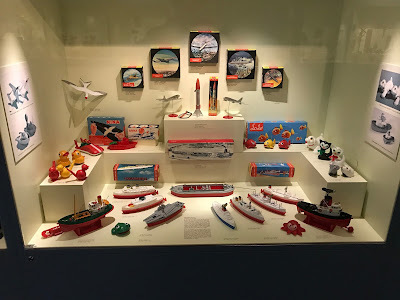 The Toy Museum was primarily a fairly standard static collection of historical toy displays, and a small "Children's Room" with simple activities, not directly connected to the collections. This seemed like a missed opportunity, not only because the subject of toys naturally lends itself to interactive exhibit areas, but also because Nuremberg has a history as a "Toy City" and continues to host an annual international Toy Fair. 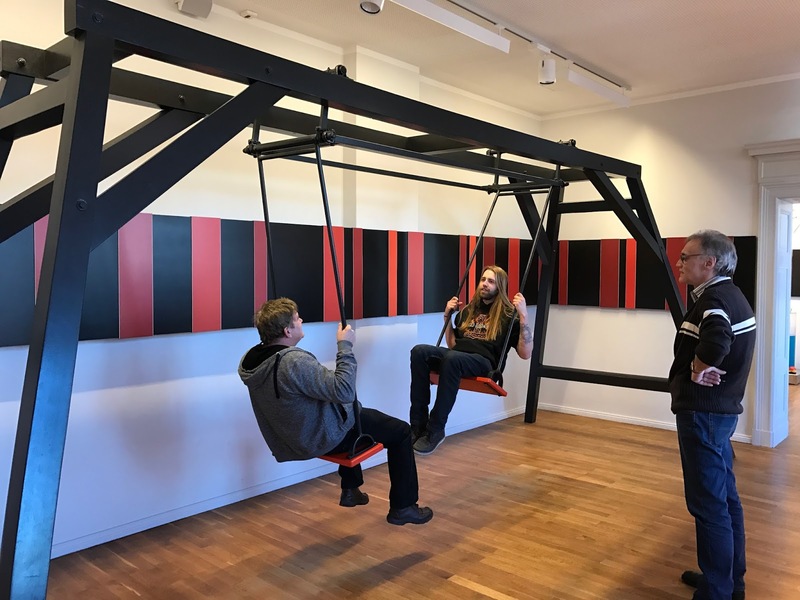 I think the Toy Museum could really benefit by teaming up with design students or emerging museum professionals to expand the museum's repertoire of interactive experiences. Albrecht Dürer's House was a delightful blend of a historic house of one of Nuremberg's most famous citizens, as well as a combination of different interpretive techniques, including a very good audio tour, meaningful touchscreen interactives, and participatory elements like a printing press room where visitors could make their own prints. All of these elements worked well to give a strong portrait of the famous Renaissance artist Dürer. In all honesty, before visiting Nuremberg in person, my main association with the city was the famous war crime trials that happened after World War II. My hosts thought it was important that I see the Documentation Centre Museum and I'm very glad I did. The Museum is situated outside the Old City, at the former Nazi Party Rally Grounds. Because of Nuremberg's relationship to the Holy Roman Empire, Hitler and the Nazi party constantly used the city as a backdrop for rallies and as a justification for German "purity" and the Third Reich. 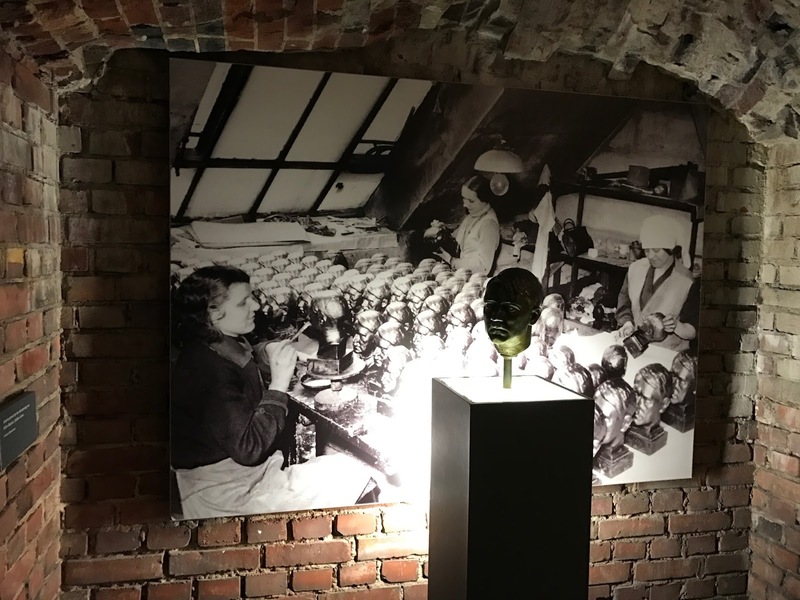 The experience of visiting the Museum is completely linear and led by an audio tour that very carefully brings you through the history of Hitler's rise and the importance of Nuremberg in that rise. Because the museum cuts through the old Nazi Party Rally Grounds buildings, you are literally walking through history in an extremely place-based way. It's hard to describe how upsetting it was to go through the Documentation Centre Museum and learn in excruciating detail about the activities centered around Nuremberg and the rise of Hitler and not find striking parallels to what President Trump and his advisors are doing right now in Washington. I'm ashamed of my historical ignorance regarding the Nazis and Nuremberg, but I'm even more ashamed of the behavior of President Trump that appears willfully unconcerned with historical parallels in Germany. It seems easy for us in the United States to carelessly toss around words like "Nazi" and "Hitler" when talking about someone you disagree with politically. 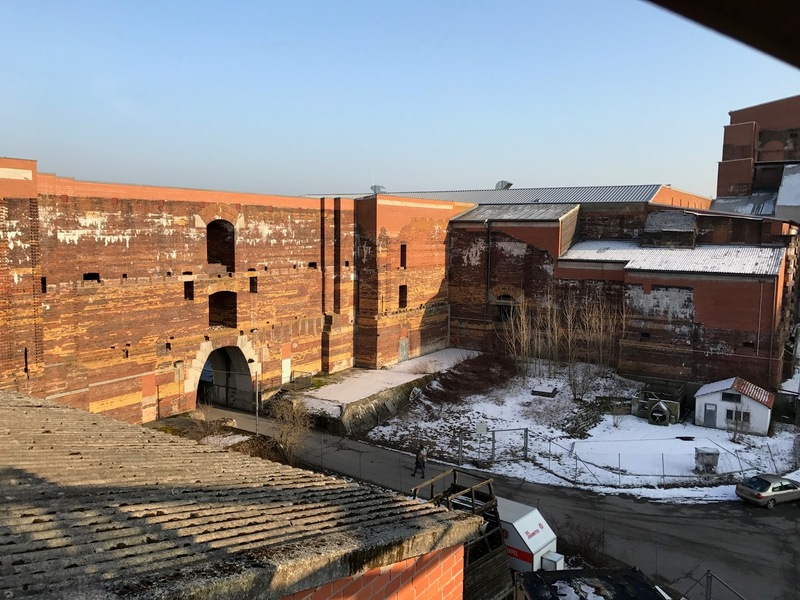 But I urge ExhibiTricks readers of all political stripes to learn more about what happened in Nuremberg (through the Documentation Centre Museum website and other sources) to compare that history to current U.S. events. All in all, it was a fascinating trip to Germany, that helped me not only reconsider my museum professional practice, but also my place in our interconnected world. Thanks again to Hüttinger Interactive Exhibitions for giving me such an opportunity!